Budget Session of Parliament: The Lok Sabha and the Rajya Sabha reconvene just two days after a big win in for the BJP in assembly elections in Tripura, where it ousted the Left after 25 years in power. New Delhi: The Lok Sabha and the Rajya Sabha were adjourned for the day amid slogan shouting by opposition lawmakers after parliament reconvened on Monday after a recess. In the Rajya Sabha, both the BJP and the Congress have moved adjournment motion notices on issues the parties say must be discussed immediately, setting the tone for a stormy second half of the budget session. The BJP wants to debate "reports of corrupt practices indulged in by relatives of former ministers under tacit protection by ministers," after the arrest last week of Congress leader P Chidambaram's son Karti Chidambaram. The Opposition has demanded an explanation from Prime Minister Narendra Modi on how jeweler Nirav Modi defrauded the public sector Punjab National Bank (PNB) and fled the country under his watch. Union minister Piyush Goyal said today that PNB bank scam involving Nirav Modi and Mehul Choksi "is connected to Congress". "The problem started during their time. They cannot mislead the nation on this issue," he said. Congress leader Anand Sharma, who has moved the Congress notice said, "We will demand answers from the government on the bank fraud scam. We will also demand answers from Prime Minister Narendra Modi as the scam happened right under his watch." The government is seeking to dull the opposition's offensive by bringing to parliament in this session the Fugitive Economic Offenders Bill, a proposed law to punish people accused of committing financial crimes in India and then fleeing the country as Nirav Modi and liquor baron Vijay Mallya have done. The BJP's counter-offensive is the attack on the Congress over Karti Chidambaram's arrest in a corruption case from when his father P Chidambaram was Union Finance Minister in the Congress-led UPA government. The Congress is expected to protest against the arrest in parliament. Mr Chidambaram has called it a case of "political vendetta" and Anand Sharma said the Congress will raise the issue of "selective vendatta at the hands of investigative agencies by the BJP-led government." The BJP-led government continues to face pressure from ally Telugu Desam Party (TDP) of Andhra Pradesh chief minister Chandrababu Naidu, which alleges that the state has been shortchanged in the union budget this year. 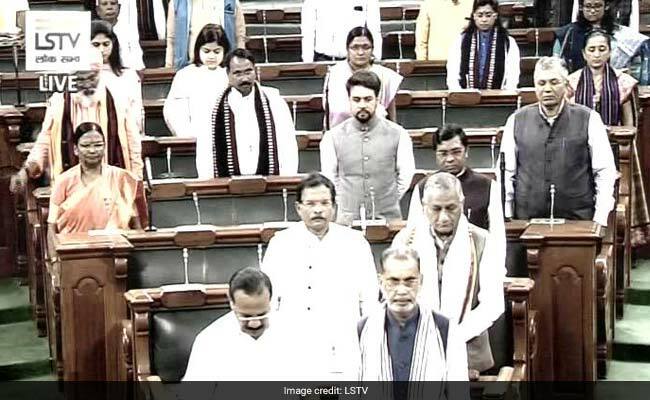 The Rajya Sabha was adjourned till earlier today after TDP lawmakers protested seeking special category status to Andhra Pradesh. The government will likely push for the passage of the bill to make instant "triple talaq" a criminal offence. It has proposed up to three years in jail as punishment for a Muslim man who seeks to divorce his wife by saying "talaq" thrice. The bill was passed by the Lok Sabha in the last session but was stalled in the Rajya Sabha as the opposition sought changes. Parliament reconvenes just two days after a big win in for the BJP in assembly elections in Tripura, where it ousted the Left after 25 years in power. It was three out of three for the BJP as governments backed by it will also take over in Nagaland and Meghalaya, the two other north eastern states where elections were held. In the first half of this session, Finance Minister Arun Jaitley presented the last full-year budget before the 2019 election. Mr Jaitley announced what he called the world's largest government-funded healthcare scheme to cover 10 crore poor families. The Budget session which began on January 29, will end on April 9. Parliament had adjourned for a 23-day recess on February 9.